So this is a sneak peek at the guest towel pattern. The colour is a warm pumpkin and you can see the Maltese cross effect. I'll share all about the project in the next post. I'm covering a side topic that came up along the way. Hemstitching! I get emails from newbie weavers who ask me how to do better finishing on their projects and so this is a brief tutorial on this basic decorative needlework. In this picture above, after a half inch woven of scrap yarn I have woven a two inch hem allowance and now plan to hem stitch every six warp ends ( I have three ends per dent in a 12 dent reed which helps to make that decision.) I left a tail of weft yarn which is four times the width of the warp dangling out on the right hand side. It may be easier to leave it on the left side if you are left handed. Bring the needle under the warp ends and pull through. Then bring the needle back through from the same direction, but this time place the needle point down about two or three threads into the cloth, normally at the spot of the last warp thread taken. Pull the needle through. I personally don't go further into the cloth than two or three ends as to my thinking, the stitching purpose is to secure the weft threads into place and hold them there. Decorative embroidery is not my main focus here. ﻿Then give the thread a good tug! You develop a feel for how taut to make it. Don't worry about the little 'holes' as this is all resolved during wet finishing later on. I also recommend that you don't do the stitches too loosely as it can increase the snag potential later, especially if you are hem stitching a scarf edge or shawl. This is a heavy seine twine cord which is used for rug warps and tapestries. I inherited this cone some years ago and maybe one day it will help form a rug warp, but in the mean time I need a 20 inch piece for this towel project. You can also use mop cotton or enough ends of a scrap yarn to create the space you are looking for. I'm trying it on this towel doubled and lay it in snugly with a handy loop for pulling it out later. A bump with the beater straightens it nicely. With my new weft yarn, I leave another tail four times the width of the warp and weave a few repeats of the border and pattern repeat. Then I gently hold the warp at the left edge with one hand and pull the cord out on the right. Then I hemstitch by taking the needle under the bundle and pull it through. Then as with the previous bottom row, I bring the needle back round again and place the point into the second or third row of weft and pull through and pull tautly. This is called 'Ladder Hemstitching'. In this particular method you divide the grouping by taking three warp ends from one group and combine it with three warp ends from the next group. It produces a distinctive 'V' formation! I think it makes a nice alternative to the ladder. This is a mercerised cotton warp and so the ladder or trellis might lose some of their definition when washed. The bundles being tightly secured helps keep their shape. I have also found that when linen is used as the warp, the ladder or trellis hemstitching stays much crisper looking. Next post I will show you some another interesting border treatment. My brother was here for a brief visit and we heard all about his recent trekking Manaslu in Nepal. He was there for just over three weeks and took many pictures again and has agreed to send me some pictures and a story line. It may be some time before this happens but I'm looking forward to setting it up for you! thankyou for this post!I embroider endings in linnen when making the bunad (our national costume) have not thought to do the same on the loom. It is early in the morning here on P.E.I. and I read your directions on hem stitching. When your warp is off the loom, do you wash the warp "as a whole warp", and then cut apart the guest towels? I can't vision what the end of the guest towel will look like. Perhaps, I have just not had enough coffee today. I see the approximate 2" space between the towels, do you just cut down the center of this space and have a small fringe at each end???? Not a great time of the year to be selling a house, no doubt yours will be sold, you did such a wonderful job with the renovations - you just never know who is going to walk in and make an offer. It is early in the morning here on PEI, and I read your great instructions about the hem stitching. My question is, do you cut the warp apart before wet finishing? Also, how close to the hem stitching can you clip the threads, or is there a little fringe on the end of the guest towel? Perhaps I need more coffee to understand this. Don't forget to bury your St. Joseph in your front yard. My house in New Mexico sold quickly, and my neighbor dug him up and sent him to me after the house sold. Hemstitching seems to be tricky for new weavers (that's from personal experience) but it gets easier the more you do it. You did a great job showing your method. Super helpful. I just learned how to properly do this 2 weekends ago, and it makes a big difference. I was thinking, Gosh, someone should put this on the web! And that thought must have gone straight to your brain. Thanks for putting this up. Have heart Susan, your house will sell quickly. How do I know this...I have both bought a house in December and sold a house in November. There are always people out there looking to buy - as they say believe and it will happen. Love your hemstiching demo - very nice way to introduce newbies to this type of needlework. Keep your chin up and keep weaving! This is by far the best description of hemstitching I've ever read. I love the ladder effect! That is so neat! Hi Susan, Great tutorial. It seems from the pics that you hemstitch over pattern rows rather than weaving a few rows of tabby to stitch over. Must try that. I was going to cover more details on the actual towels in the next post as my emphasis was on the actual hemstitching this time round. I weave 2 or 2 1/2 inches for a hem allowance, hemstitch, weave the main portion of the guest towel, then *with no further hemstitching* I weave a border for the end hem. I then weave approx 1/2 inch of scrap yarn to be a break between towels and then start the hem of the next towel. Later I will serge the towels apart, pin/iron the hems and hand sew. Then they are washed. There is nothing to stop you from washing the entire warp as one long piece and then doing the steps above. I prefer to do it the first way. Thanks for the refresher course on the hemstitching. I too start at the right and always got annoyed at myself when I couldn't do it correctly from the left, but I know I'm a righty all the way. Don't worry about the house, we sold ours in two months, it just takes some patience and the right buyer. We placed ours in God's capable hands and prayed that He'd take care of the details. I can't wait to learn more about the actual towels themselves - that is a really beautiful pattern! How many harnesses did it take to achieve that? The draft is from The 8 Shaft Pattern Book by Carol Strickler and is, of course, an 8 shaft draft. I have to dig out the actual page number and will post that next time. Hi Susan - what a great tutorial with very helpful pictures ! You are a natural teacher. The instructions are so easy to follow and the result is so professional looking. Another reference tutorial to add to the list. How did you find time to do all of that with everything you have going on !! Great post Susan. I love tutorials with lots of photos and yours are among the best! Your finishing techniques have always been stunning and so it's lovely that you share your knowledge. Thank-you so much for posting this tutorial. I have some books/articles on hem/fringe finishing techniques; while they provide an adequate treatment of the subject, they cannot match the effectiveness of your step-by-step instructions and photographs. Barbara: I prefer to cut apart the towels, hem and sew and then wash due to having washed all one long warp and found that my washing machine had coiled it up like a snake and I had one heck of a time to get it unwound! It had also damaged one or two of the towels so I reckoned there had to be a better way to do this! Maybe the new washers are better but I'm stuck with my old style agitator for now. Dianne: I find that weaving plain weave hems spreads the width of the warp. So I do twill borders and when I move into the main portion of the towel, runner etc. there is little to no difference in width. Even a few shots would spread it out so I give plain weave a pass. Thanks for the good wishes and tips on how to ensure the sale of our house. No religious icons here as that's not our style. We are actually quite okay that this deal will 'time out' and fail... so next spring there will be a fresh start. I appreciate the the comments on the tutorial! 1) If you were using the lattice hemstitching as part of the pattern, I would certainly understand it - it's quite attractive. But it appears from the narrative that you're planning to cut the two towels apart, meaning that the beauty of the lattice technique will be completely lost, no? So perhaps you showed the technique simply as a demo? 2) As guest towels, it also seems to me that you'll be actually hemming both ends. That is, no fringe. Is that true? If so, then the on-loom hand hemming is lost within the sewn/finished hem, yes? I used to do on-loom hand hemming for EVERY piece, but gave it up when it's a piece that's going to have a machine hemmed edge; I still do it for every piece that will have fringe. Is there a good reason to return to it for pieces that will be machine hemmed? Oh, dear... I seem to have not explained myself very well, even with hubby proofing for me! Since I'm planning a second installment, I had better really work on it! 1. I do *not* cut between the rows of hemstitching. The hemstitching is part of the decorative treatment for the leading edge of the towel. 2.Yes, both ends will be hemmed. I would agree that handwovens with fringes must be hemstitched. 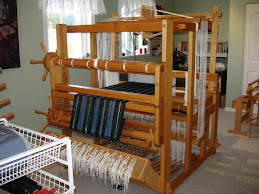 This warp is still on the loom but I will find a picture of my last guest towel warp to show you a finished result. Peg: please send me your email address to my yahoo account. This is a conversation that is too involved for this venue. Thank you for the hemstitching tutorial, I'm getting ready to start a scarf and will have to try out your techniques.